The team behind the creation of the Celestion impulse downloads talk about their motivation, the process they went through to achieve this major innovation, and what it’s going to mean for musicians in the studio and playing live. Where did the motivation come from to capture Celestion speakers in a digital format? As a company we keep a close eye on developments in the music world, especially among guitar players. 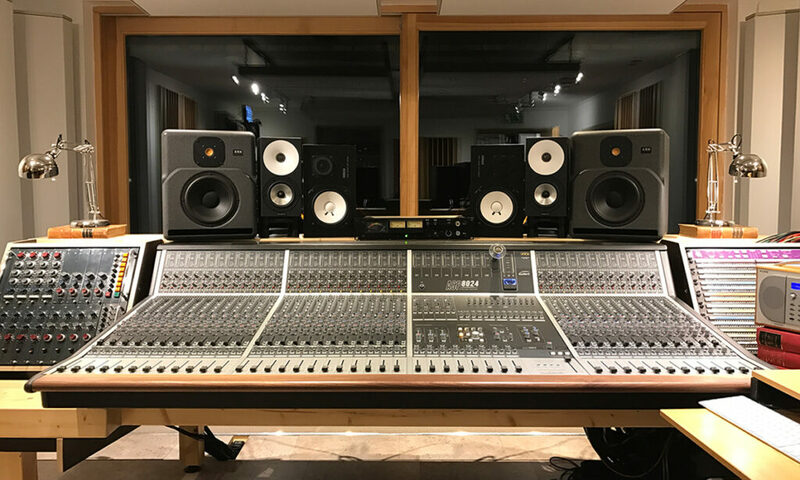 And we’ve noticed a big growth in the use of impulse responses – with many musicians experimenting and trying to recreate the sounds they love, whether it’s the sound of a specific space, or the tone of a particular speaker/cabinet combination. Another big trend we’re seeing is that a lot of guitar players don’t just have a guitar, an amp and a speaker – they also often have pretty sophisticated recording and modelling gear, because they want to record their work and mix their own sound. So these players are looking around for ways of achieving different tones and effects, and are actively looking for downloadable IRs to help them do this – so we were seeing a clear demand out there. At Celestion we have a reputation for being in the forefront for speaker tone, so we felt it was time to take the lead on this and offer the tone of some of our most iconic speakers in a digital format – but in a very high quality way, as an authentic alternative to our physical speaker range. Seems like a simple idea – was it simple to do? No – far from it! Up till now, many impulse responses had a reputation for being stiff, fizzy and not ideal sounding – and there’s a reason for that. Capturing the complexity and richness of analogue tone in digital format turns out to be really, really hard to do well. The gear you use, how everything is positioned, the acoustics of the space you do the recording in, all have a big influence. And then you need expert human judgement – someone with the ability, experience and incredible attention to detail, to tweak everything until it’s just right. So it’s not something that people could create themselves if they already own a Celestion speaker and some recording equipment? Our method of calculating the impulse response is far more accurate than any publicly available software, giving a more realistic IR as a result. It’s possible to capture your own, but if you AB against the real thing you’ll notice it’s lacking. The trend in recent years has been to move away from long recording sessions in large live rooms, with an experienced engineer setting up the guitar amp and mics where he/she knows they sound good. Unfortunately this has meant that sometimes the results suffer, often great live takes will have spill, or could be enhanced and crafted with some careful mic choice/placement. We’d all love to record with a Royer ribbon mic and some stereo Neumann room mics in a fantastic live room, but in real world recording situations you’re often forced to compromise. Now you can record that great live take with all the feel of the full band performance, but recording the amp DI and using our IRs allows you to tailor the tone to suit the track later – once you’ve added all the other layers. So how exactly did you go about capturing these impulse responses? All we’re willing to divulge is that we took an incredibly scientific approach and the method we used is completely unique. We put in a lot of research and development effort to find a superior method of calculating the impulse response, to get it just right. Basically, we cut no corners at any stage. We went for the best of everything – the gear, the recording space and the engineering – to make sure that we created a truly definitive product. So, can you rely on getting the same results every time and wherever you are? Yes. That’s probably the biggest benefit of using IRs – both for studio recording setups and live gigs. If you are overdubbing parts of a song that were recorded in a studio and you tried to set up a cab again it would be very hard to get the exact same sound. With impulse responses you can get the exact same sound days or weeks later, so you can overdub parts you are not happy with later, without any difference in tone. And for a live application, using IRs gives you the same sound in your monitors every night. This means consistent live sound at every gig and simpler, quicker sound checks and less worry. Another major benefit for live musicians is that you can get your exact studio sound live. Some microphones you’d use in the studio have non-ideal directivity or are too fragile to use at a live gig, which creates a discrepancy between your studio sound and your live sound. By using impulse responses instead you can eliminate this, so your audience gets to hear a higher quality performance which is much closer to any recordings they may have of you. Why did you choose Decoy Studios for the recording and Mike Spink for the engineering? We checked out a number of studios before settling on Decoy. All of the studios were great in their own way, but some of them were simply too distinctive, like being too “honky” or “dark”, and that would have affected the final tone too much. Decoy Studios was very diffuse and neutral – which let us capture the Celestion tones in a really pure way. When it came to choosing a sound engineer, going with Mike Spink was just a no-brainer. As well as being an experienced sound engineer and mixer, he’s also a successful record producer. He understands about studio sound, but also about how that sound is going to translate when it’s played in a different space or put through a range of different equipment – which is exactly what’s going to happen when people start using our IRs. He knows about mixing live sound as well as studio recording – and both of these are important for our customers. We were also impressed with the sheer range of different guitar sounds that Mike has been involved with over the years – from heavier guitar sounds like the Kaiser Chiefs, through to a more pop rock sound like The 1975, or Jake Bugg. This gave us confidence that Mike would be able to get a handle on the whole range of Celestion speakers we wanted to sample. How precise are your impulse responses? The output is closer than anyone can currently get to the real thing. We are struggling to hear any difference – when we listen on studio monitors in the control room it is sounding the same. We can’t say it’s exactly the same, but the differences are so subtle that you’d need to be a real expert and in very controlled conditions to spot them. With this level of quality, aren’t you worried that customers might only buy the downloads instead of the real thing? Our customer feedback says no. When our customers want to get an actual Celestion speaker, they generally go ahead and get one – unless they have a problem, like not having a suitable space to use it in. The impulse responses are a great workaround and allow people with this type of issue to get an authentic Celestion sound but without waking up the whole apartment block! We don’t just see the impulse responses as being a straight alternative to owning a physical speaker – we see them as being complementary to each other. You might have a real Celestion speaker at home or in the studio, but use your IRs for getting a repeatable sound in live gigs, or when you go round to a friend’s place for a practice session, for instance. Or, you might want to use the IRs to help you choose which physical speaker to buy. Having the IRs just gives our customers a greater variety of ways of achieving a great Celestion tone. What can you do with IRs that you can’t do in physical reality? How can they make it easier to create a great sound? The main thing the IRs do for you is to save time – while also opening up the possibilities for being creative. You’re no longer limited by having a single speaker cabinet and mic setup. You don’t need to spend time setting up microphones, and you don’t have to worry about phase issues either. For example, you could use a dynamic mic close to the speaker and a ribbon mic further away and blend them together and have them still in phase. Most people love the sound of a dynamic mic mixed with a ribbon mic but have trouble setting them up without running into phase issues or using non-ideal mic positions. The impulse responses allow you to use the ideal mic position for each mic, and still have everything in phase. Can you give more examples of how using the IRs makes mic setup issues easier? With these downloads you can have two mics physically in the same location, which you can’t do with a physical setup – both on the exact sweet spot. Another option which you would find hard to do in a physical setup is to have one mic on an open back cab and one on a closed back. The closed back fills out some mics whereas the open back adds clarity to others. Another trick is trying a different cab on room mic – e.g. 4×12 cab on room mic to fill the room and give a big sound but use 1×12 on spot mics to get a really coherent direct sound. Using the IRs makes this type of effect easy to achieve, but isn’t something you could do easily in real life. If people want to get a good sound quickly, they don’t have to worry about mixing different mics etc – they can use the pre mixed blend that comes with the IRs for an instant premixed guitar sound. Or they can easily mix multiple IRs together to create their own mix very easily, using their DAW. All our IRs are in phase with each other, so you don’t have to compromise the sound of each mic to align the capsules. For instance, you can blend an SM57 on the grille with a Royer placed further back, and get a really nice sound balancing between the two. You don’t have to compromise the proximity effects on the low end to balance the high end as you wish; just select the thin/balanced/fat for each and mix to taste. Another big issue with physical mic setups is spill, where one mic picks up the sounds from an instrument or vocal it wasn’t meant to. You don’t have to worry about this when you use IRs. This makes it easier to fully isolate the different instruments and vocals, which gives you a cleaner sound and makes mixing much easier. And of course the biggest advantage of all is repeatability. A lot of players will spend a lot of time taking notes, making measurements or even diagrams when they find a setup that works, so they can recreate the same setup again in the future. Using IRs you don’t have to do this anymore – you know you’re going to get the same result every time and you can start focusing more on the creative elements instead. And can you tell us more about how using these IRs helps the creative process? Once you have a set of IRs you don’t just have to pick one – you can mix them together if you want to get the precise tone you like. You can even mix completely different speakers together – like a Creamback H which is brighter, with a Creamback M which is softer – to give a fuller sound. And the tone you end up with might be something that you could never achieve with a physical setup, which really helps a player or a band find a distinctive sound. The other benefit is the sheer range of tones you can choose from. If you are using your own gear you may only have one or two different cabs/speakers, which limits you. If you have access to our IR library, you suddenly have a whole range of speakers/cabs available and you can experiment and pick the combination that suits a particular song or part of a song. It’s like owning a full range of Celestion speakers and cabinets and being able to switch between them whenever you like. Using IRs also means you can make critical mix decisions after recording. So you can keep the creativity going and record it while the atmosphere is there and worry about moving mics and changing cabs/speakers later. You can get the recording done while the performers are on fire and then tweak the end details, without having to interrupt them or make them do it again. Once you have the full song recorded with all of the instruments, you have the ability to change the recording setup to complement the song. What about players who want to stick to using a traditional physical speaker – do the impulse responses have anything to offer them? Absolutely. If you’re going to buy one of our speakers you want to choose one that best complements the type of music you want to play – heavy, blues, rock etc. But most people haven’t got access to multiple speakers or versions of the same cabinet to do a fair test. The impulse responses make it really quick to compare different speakers in a controlled way without having to own lots of identical cabs and a switchbox. They can also hear how it sounds with their own amp, so they can get a very accurate feel for what results they will actually get. Then they can go and buy whichever one they like best, with a lot more confidence. So, what’s next for the team? We’re already getting questions about impulse response downloads for other speakers in the Celestion range. We’re going to listen to feedback about the current tranche of impulse response downloads and see how people are actually using them. We’d definitely love to capture impulse responses for more speakers in the range. We’ve proven the concept and we want to continue taking a lead role in this area, just the same as we have with physical speakers for the past 90 years.